the horizontal line in a graph along which are plotted the units of one of the variables considered in the study, as time in a time-temperature study. The other line is called the ordinate. Axes of graph showing normal distribution curve. In a plane cartesian coordinate system, the horizontal axis (x). Compare: ordinate. 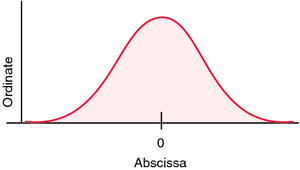 /ab·scis·sa/ (ab-sis´ah) the horizontal line in a graph along which are plotted the units of one of the factors considered in the study. Symbol . a point on a horizontal Cartesian coordinate plane measured from the y-axis (or vertical axis) running perpendicular to the plane, or the x-axis. In a plane cartesian coordinate system, the horizontal axis (x). the horizontal line in a graph along which are plotted the units of one of the factors considered in the study, as time in a time-temperature study. The other line is called the ordinate.